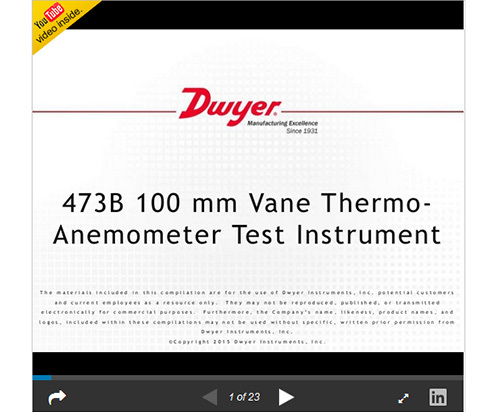 The MODEL 473B 100 mm Vane Thermo-Anemometer Test Instrument is a versatile unit that quickly and easily measures air velocity or volumetric air flow, as well as air temperature and humidity in imperial or metric units. A stainless steel 100 mm vane probe is included, which has a comfortable hand grip. The extruded aluminum housing fully protects electronics, yet is lightweight and comfortable to hold. Process: -20 to 212°F (-29 to 100°C); Ambient: 5 to 125°F (-15 to 51°C). Air Velocity: 40 to 5000 fpm (0.2 to 25 m/s); Volumetric Air Flow: 19,999 in selected flow units; Temperature: -20 to 212°F (-29 to 100°C); Relative Humidity: 0 to 100% RH. Air Velocity: ±1.5% of reading ±20 fpm (±0.1 m/s) [0.25 to 10 m/s]; ±1.5% of reading ±40 fpm (±0.2 m/s) [10 to 20 m/s]; ±1.5% of reading ±60 fpm (±0.3 m/s) [20 to 25 m/s]; Temperature: ±0.54°F @ 77°F (±0.3°C @ 25°C); Relative Humidity: ±2% @ 77°F (25°C) [10 to 90% RH]; ±4% [0 to 10, 90 to 100% RH]. Air Velocity: 1 s; Volumetric Air Flow: 1 s; Temperature: 1.5 s; Relative Humidity: 1.5 s.
28" (71 cm) retracted; 6' (183 cm) extended.